Godber is moved into Fletch's cell as a "temporary" resident. This is one of the best episodes, almost entirely consisting of dialogue between Fletch and Godber throughout the episode. 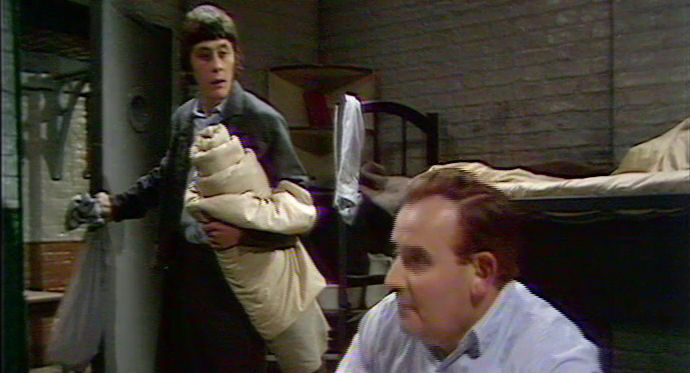 Whilst remaining an hilarious episode, you get to see the human side of Fletcher and Godber during their "Night In". Godber finds it tough each time the door closes. Fletch, despite his cynical exterior shows a soft side to his nature and teaches Godber the importance of keeping your own private world in your imagination. A hilarious clip where Fletch advises Godber to curb any carnal thoughts.